The definitive luxury single malt The Dalmore is set to add to its repertoire of exceptional rare and aged whiskies with The Dalmore 40 year old. Building on The Dalmore’s pioneering heritage in the art of maturation, The Dalmore 40 has been carefully nurtured and crafted by renowned Master Distiller Richard Paterson. Having been laid down to cask 40 years ago, The Dalmore 40 has been maturated in American white oak ex-bourbon casks, before being transferred into 30 year old Gonzalez Byass Matsualem oloroso sherry butts and finally finished in first fill bourbon barrels. The result is a liquid featuring flashes of amber and fire gold, offering a multitude of aromas including Columbian coffee and marmalade. On the palate, gingerbread and honey is followed by a generous aftertaste of Sanguinello blood oranges over ripe Bramley apples and liquorice sticks. This latest expression from The Dalmore further underlines the distillery’s reputation for maturing its whiskies for longer and in a greater variety of casks than many other whiskies, which is only possible due to the depth and complexity of its new make spirit. Presented in a decanter designed by artisans at renowned French crystal house Baccarat, the hand-blown decanters are adorned with The Dalmore’s iconic 12 point Royal Stag emblem created by Royal Warrant Holders Hamilton & Inches. The release comes during the year of celebrations to mark Master Distiller Richard Paterson’s 50th year in the whisky industry. Master Distiller Richard Paterson commented: “In the year that I reflect on my time in the whisky industry, and indeed at The Dalmore, it has been a great privilege to release two of our greatest ever aged expressions – first the champagne finished 50 years old and now this exceptional 40. 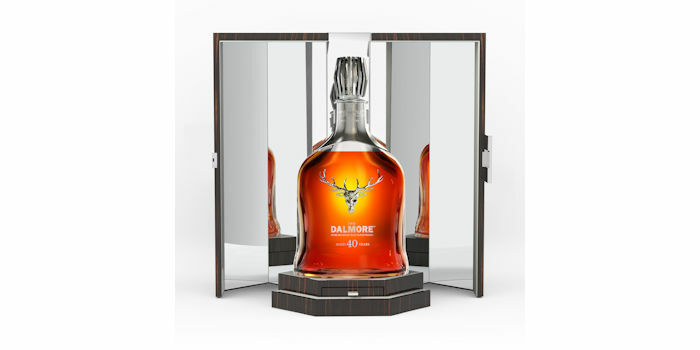 Up to 750 bottles of The Dalmore 40 will be released this year globally through selected whisky specialist retailers. Price available upon request.